Blow the Man Down originated in the Western Ocean sailing ships. The tune could have originated with German emigrants, but it is more likely derived from an African-American song Knock a Man Down. Blow the Man Down was originally a halyard shanty. A variant of this is The Black Ball Line (with a more positive view of the Blackball Line as well). There are countless versions of Blow the Man Down. The one here is from the Burl Ives Songbook and tells of the Blackball Line. The Black Ball Line was founded by a group of Quakers in 1818. It was the first line to take passengers on a regular basis, sailing from New York, Boston and Philadelphia on the first and sixteenth of each month. The Blackball flag was a crimson swallow-tail flag with a black ball. The ships were famous for their fast passage and excellent seamanship. However, they were also famed for their fighting mates and the brutal treatment of seamen. (Western Ocean seamen were called “Packet Rats”). Many ships bore the name “bloodboat.” Most of the seamen hailed from New York or were Liverpool-Irish. 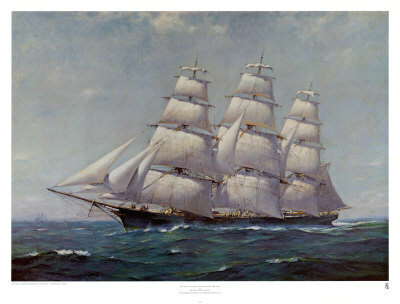 By 1880 the sailing ships were being replaced by steamers and the packets entered other trades or were sold. Thanks to www.contemplator.com for this research. Give me some time to [C] blow the man down. You’d split your sides laughing at the sights that you see. That ship for prime seaman on board a Black Ball. “Lay aft,” is the cry,”to the break of the Poop! For “Kicking Jack” Williams commands the Black Ball. For right there above you flies the Black Ball.